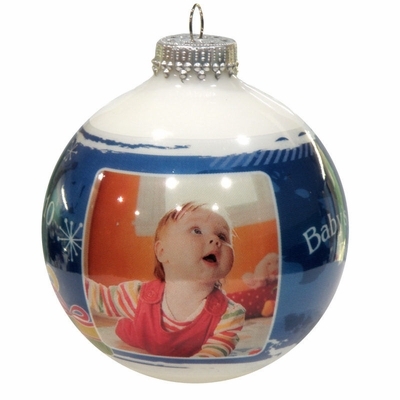 Personalized Ornament with Blue Icicle Design. We are now offering break resistant Bohemian glass bulbs for an additional $10.00. The Bohemian glass bulbs are thicker and more durable than our standard bulbs and have a deeper and richer hue, making your images even richer looking on the bulbs. You can add the picture and few lines of text. The text you see on our ornament sample is just an example what can be done. Good : acrylic ball ornaments (new economy option ! Acrylic balls have a visible seam on the side but if you are looking for unbreakable economy option to glass ball, this is your best choice!